WASHINGTON — Senate leaders agreed to hold votes this week on dueling proposals to reopen shuttered federal agencies, forcing a political reckoning for senators grappling with the longest shutdown in U.S. history: Side with President Donald Trump or vote to temporarily end the shutdown and keep negotiating. One vote will be on his own measure, which reflects Trump's offer to trade border wall funding for temporary protections for some immigrants. It was quickly rejected by Democrats. The second vote is set for a bill approved by the Democratic-controlled House reopening government through Feb. 8, with no wall money, to give bargainers time to talk. Both measures are expected to fall short of the 60 votes needed to pass, leaving little hope they represent the clear path out of the mess. But the plan represents the first test of Senate Republicans' resolve behind Trump's insistence that agencies remain closed until Congress approves $5.7 billion to build a wall on the U.S.-Mexico border. For Democrats, the votes will show whether there are any cracks in the so-far unified rejection of Trump's demand. Democrats on Tuesday ridiculed McConnell's bill, which included temporarily extended protections for "Dreamer" immigrants but also harsh new curbs on Central Americans seeking safe haven in the U.S.
"The president's proposal is just wrapping paper on the same partisan package and hostage taking tactics," offering to temporarily restore programs Trump himself tried to end in exchange for wall funding, Schumer said. 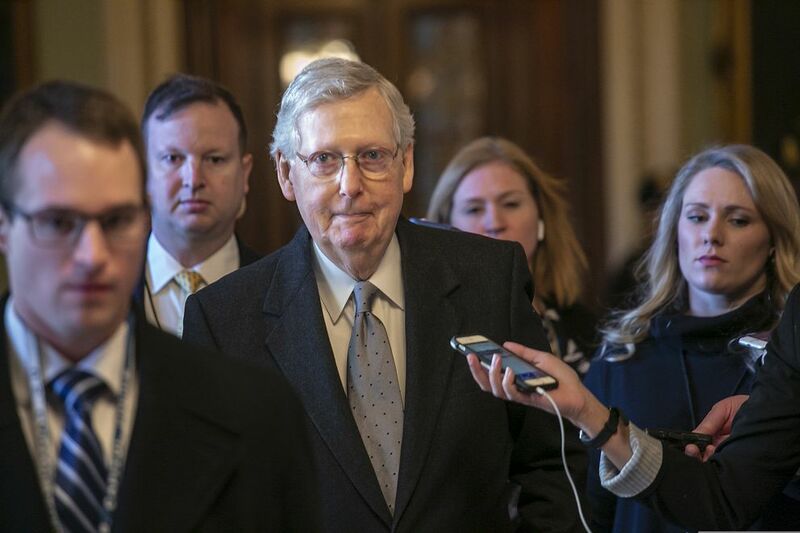 McConnell accused Democrats of preferring "political combat with the president" to resolving the partial federal shutdown, which stretched into its 33rd day Wednesday. He said Democrats were prepared to abandon federal workers, migrants and all Americans "just to extend this run of political theater so they can look like champions of the so-called resistance" against Trump.